Bear hunting with Mackay Bar Outfitters and Guest Ranch is likely one of the most versatile bear hunts in North America. We offer 3 different kinds of bear hunts: spot and stalk, bait, and boat and glass. There is a bear hunt for everyone! We will always determine what kind of hunting will be done each day based on weather conditions, your physical condition, as well as where we have been seeing bears. Our hunt packages include jet boat transportation to/from the Ranch, guides, horses, four wheelers, boats, lodging and meals. Our hunts are 6 day/5 night hunt giving you ample time to look for the big one and take in several different ways of hunting for them. 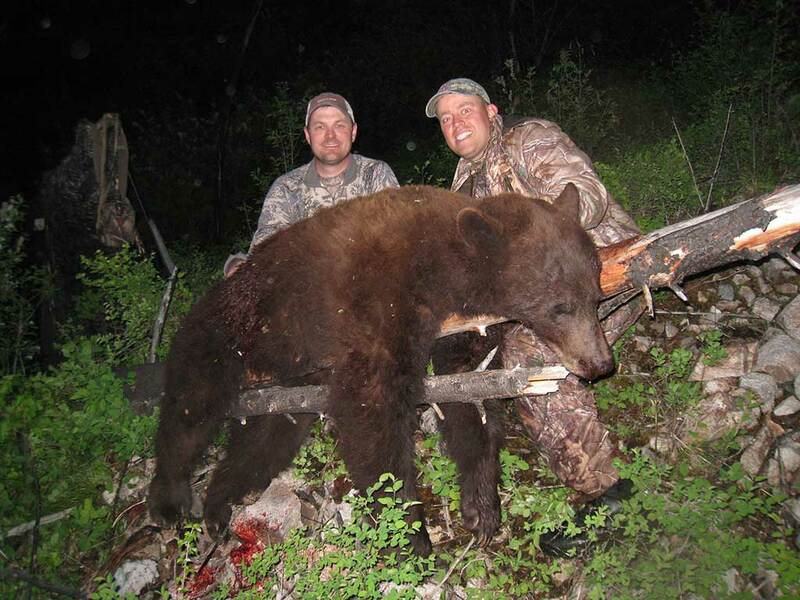 If you do happen to tag out early, a second bear can be taken in our area (trophy fee applies). This second bear tag can be purchased in advance at a reduced bear tag fee. 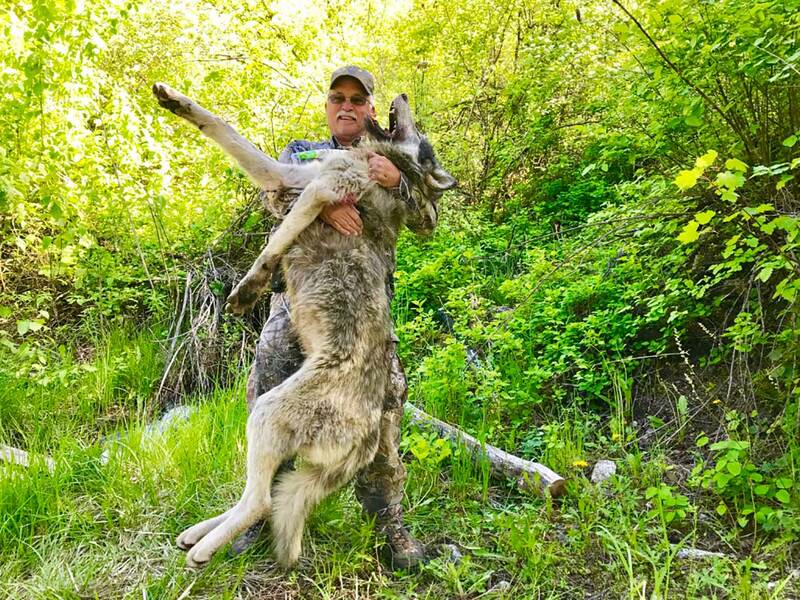 We always recommend our hunters also purchase a wolf tag. Although we do not actively “hunt” for a wolf, incidental sightings can be common and are always a great bonus when taken during one of our bear hunts! During each week, we take four hunters at a time. We have two guides for the four hunters. Ideally, if you can arrange a party of four – you will have the hunt to yourselves. If you are not able to book all four hunt spots, we may, throughout the hunt, have all four hunters together during some days of your hunt. This is common when we spot and stalk from the boat as it is very beneficial to have a boat driver (guide #1) as well as the additional (guide #2) spotting from the boat to cover country. This increases the odds of spotting bears in the steep drainage’s along the river. In our hunting unit, you can get two bear tags (over-the-counter). Our hunting units are especially known for color phase bears. Bear hunting along with any of our other ranch hunts offers a great opportunity to bring your family where they can either join in on the hunt or stay at the lodge, relax and enjoy the day to day activities at the Ranch. All of our Spring bear hunts take place from our River front lodging on the Salmon River. Hunt Dates: reach out to us to book or inquire about one of the following weeks for our 2020 (or 2021) season! Additional costs would include: bear and wolf tags, Idaho nonresident hunting license, taxidermy, meat processing (if you choose to have meat taken from the field), guide/staff gratuity, and alcohol.